This isn’t going to be the most glamorous of blog posts but this is something that I have wanted to talk about for quite some time now. Deodorant. See, told you it wasn’t going to be pretty! About 3 years ago my mum gave me a clear crystal wrapped up in cardboard with a piece of string tied around it. I thought it was a decorative ornament or a spiritual crystal but she told me it was a deodorant. I thought this was totally ridiculous as I had always used branded, commercial deodorants. This was until she reminded me of the many close people around us that had sadly passed away from cancer, and that it had got her thinking that all the chemicals that we surround ourselves with can’t be good for us. Sure, we can’t blame these kind of products on cancer with no proof. But inhaling fumes from aerosols everyday – sometimes numerous times throughout the day – cannot be healthy. That’s when I made the transition to natural deodorants too, woohoo! My friends are often curious about this, asking what they smell like, what the crystal feels like and most importantly whether they really do work. So I thought I’d answer all of those questions right here, right now for all of you too! I’ve tried out a few different ones, so I’ll talk about each of those. As mentioned above, this is the first ever natural deodorant that I used. Since I was given it, I continued to use a solid Alum Crystal Deodorant for about 18 months. I was so surprised by how well it worked that I never picked up my old spray or roll-on deodorants again. It’s only ingredient is 100% earth grown alum and I bought this from amazon. It is totally scentless, has no sticky residue and lasts so much longer than normal deodorants. You simply wet it under warm water then rub it on. An amazing side effect of natural deodorants that most people experience is that you sweat a lot less! The only problem I had with this one is that I would drop it with wet hands and then it would shatter everywhere. This is the deodorant that I currently use and have been for a good few months now, from Faith In Nature. It’s exactly the same as the crystal above, but in the form of a stick so it’s so much easier to apply. As before, there’s only one ingredient – Ammonium Alum, which is a natural salt, the same as the above. At £3.59 it’s only slightly more expensive than the usual deodorants but lasts so much longer. I would recommend this to anyone! My mum even uses this one now instead of the crystal above because it’s much easier to use. It works amazingly well. This one and the next one I would recommend to those of you that have never used a natural deodorant because they look a lot more like the ordinary ones. They both contain more ingredients than the two above so aren’t as good, but are nonetheless still much better for your skin than ordinary shop-bought ones. This natural deodorant stick by Jāsön is free from aluminium, paragons, phthalates and propylene glycol. However, it still contains 20 ingredients, compared to the 1 ingredient from both listed above. These ingredients are said to all be naturally sourced and pure. It has a creamy texture and smells amazing! A great one to start with! This one by dr. organic is aluminium free, SLS free, paraben free and alcohol free and smells of coconuts. I’m a sucker for coconuts, so no wonder I’ve included this one! Having said that, the ingredients list is still a little off-putting with around 40 different ingredients! Albeit most of them are natural oils. This is a great one to start off with, but I’d still recommend moving on to a natural deodorant with one ingredient like the one by Faith in Nature above. 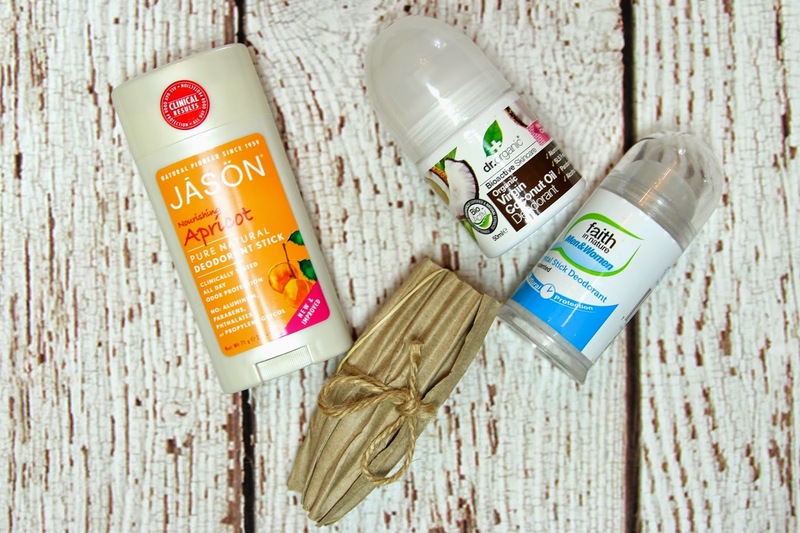 I hope this has been helpful to any of you who may have been considering a natural deodorant, or maybe it has opened your eyes a little bit to natural, healthier alternatives to the chemical products that we’re all used to.